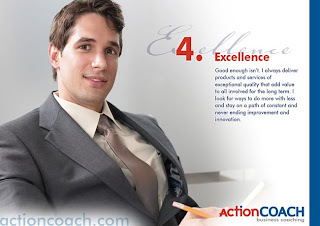 Coach David's Corner: What is Essential to Your Business? What are the top priorities for your business? Is it staying on top of technical skills and technology? Is it maintaining a strong marketing presence? Is it ensuring your service is spectacular? What is the "make or break" element to your business? Prioritizing the strategies for growing your business depends on the factors that drive success in your industry. You want to be sure that you maximize effectiveness where it truly matters, and work on the support systems to maintain that element while your company grows. Economic recessions give businesses an opportunity to cross-examine all the functioning elements of their operation and cut costs in areas that are not central to their success. When money becomes tight businesses often fall back on the barebones systems that will keep their operation going, without sacrificing the effectiveness of elements that are essential to their success. When you examine the workings of your business, be sure you have the elements of your operation prioritized correctly. While most businesses attempt to cut costs in marketing and advertising, this can be one of the biggest mistakes you can make. No business survives unless potential clients are aware of who they are, where they are, and what they do. Other businesses may try to trim their services and will sacrifice long-term clients in the process. Do you know how to manipulate the workings of your business effectively, to get the results you want? If you're not sure how to prioritize your business elements, how to manipulate processes and personnel to increase productivity or profitability, or you're wondering exactly how to maximize profits in the coming year, give me a call. 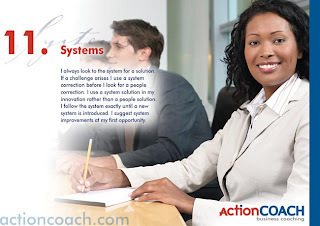 Running a business is no small task, and accessing the ActionCOACH knowledge base of thousands of business owners and case studies worldwide can bring amazing results to your bottom line. Learn the systems that will give you the greatest return on investment now and far into the future - isn't that one of your top priorities?